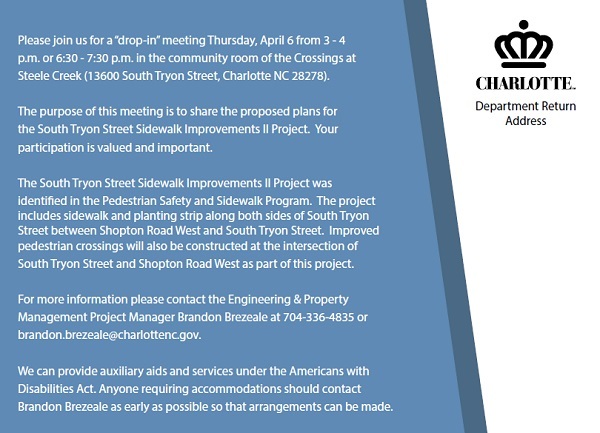 (April 1, 2017) The City of Charlotte will hold two drop-in meetings to present plans for constructing sidewalks along both sides of South Tryon Street between Steele Creek Road and Shopton Road West. 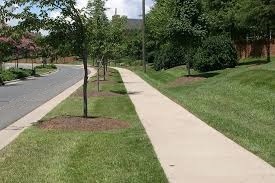 This area has numerous short stretches of sidewalks that have been built over time as development has occurred. 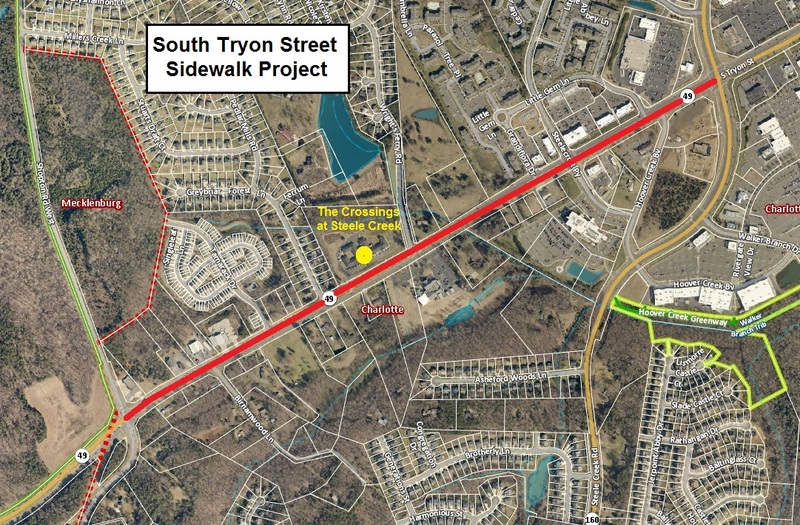 The South Tryon Street sidewalk project will connect the existing pieces to provide continuous sidewalks for the length of the project. The project includes 8-foot planting strips and 6-foot sidewalks and will create tie-ins for about 25 existing driveways. The project also includes improved pedestrian crossings at the intersection of South Tryon Street/York Road and Shopton Road West. They are estimating construction to start in August 2018 with project completion in early 2019. 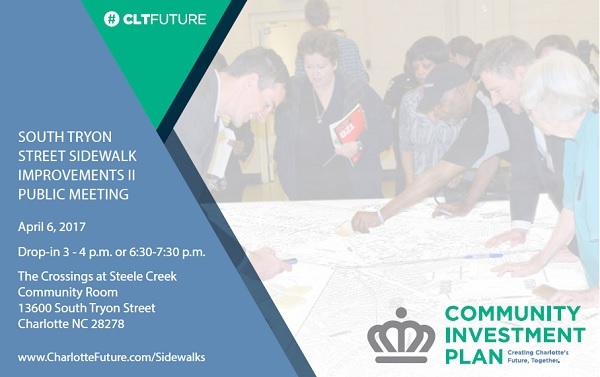 The meetings will be in the Community Room at the Crossings of Steele Creek Senior Living Center (13600 S Tryon St). There will be two sessions, one from 3:00 to 4:00 and another from 6:30 to 7:30. This city project ends at Shopton Road West because the Charlotte city limits end at Shopton Road West. To the west, State Highway 49 is named York Road, the original name of the highway that ran through Steele Creek up towards the center of Charlotte and has been renamed as Charlotte has annexed into Steele Creek. Contact Brandon Brezeale, 704-336-4835 or brandon.brezeale@charlottenc.gov with questions.